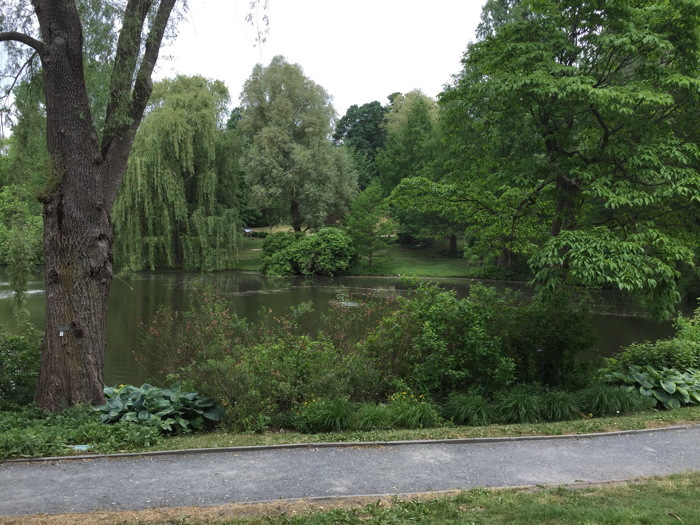 This past weekend Debbi and I flew back to Boston for my Mom’s memorial service – or her “momorial” as I started thinking of it. Since Mom passed away in March, my sister Katy and I have been working on her affairs. As the executor of her will I’ve been setting up her estate, while Katy’s been working on the memorial and having her remains interred. It’s been a lot of work for both of us, and Debbi pitched in to help planning the memorial. We took the red-eye flight Wednesday night – and boy am I getting tired of red-eyes. I think our next trip back we’ll take a daytime flight instead. On the other hand, we landed on time Thursday morning and had a quiet day hanging out with my Dad, and later with Katy and my nephew I when they drove up. It was refreshing to land and not have something I had to get done that first day. Friday was the memorial. 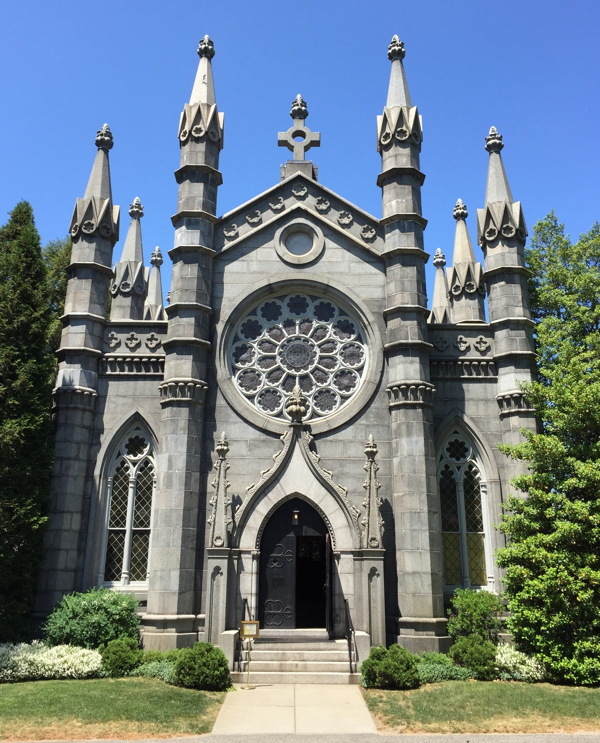 Mom’s remains have been buried at Mount Auburn Cemetery since, as Katy put it, Cambridge was always the center of the universe in Mom’s mind. We arrived around 10 am to find the priest and pianist both already there, and the caterer setting up for the luncheon afterwards. We started a bit after 10:30. Besides the priest – who I thought did a really good job – Katy read a poem she’d selected, and one of Mom’s oldest friends shared a personal remembrance. And then I shared my own memories. Writing my talk had taken chunks of time off and on for a week previous, and it was not easy to figure out what I wanted to say in public. And even after practicing it the night before, I was glad to see the others speak first so I could adjust to deliver it a bit more extemporaneously rather than just reading it. When I was writing this, I kept going back to the month before Christmas of 1999. I’d just moved to California, and I was feeling pretty homesick. Mom suggested that it wasn’t too late to come back to visit, so I lined up someone to watch my cats and flew back for the holidays. It was just what I needed. Visiting Mom for me was a time to relax: We’d sit and eat breakfast and read the newspaper, hang out reading books, and sometimes go out to eat or to do some shopping. We’d enjoy the warm days on the deck of her house, or watch the Red Sox games at night. If I headed into Boston to meet someone for dinner, I’d walk back from the subway to find the outside lights left on for me even after Mom had gone to bed. Like me, Mom was something of a homebody. She’d talked once or twice about moving after Katy and I finished college, maybe after she retired, but she stayed in her big old house as long as she was able. It was hard to beat the location, of course, but it was also obviously her home, where she wanted to spend her time and read her books and sit with her cat. And she made it a comfortable place for me to visit and get away from things in my own life for a while. Mom was always thoughtful about sending little gifts – thoughtful in the sense that I think she either really thought about them, or she’d come across something and think about someone it would be a great gift for. Gifts that maybe made you raise your eyebrows at first, but then you’d find out that they were just what you wanted somehow. One year she gave us an electric pepper shaker which Debbi thinks is the best thing ever. She’d send me articles from the Boston Globe – okay, mostly Red Sox articles, but still. She especially had a talent for finding greeting cards for every occasion. Even when she moved to assisted living, and she was no longer driving, she managed to find clever cards for the holidays and for my birthday. The first Christmas after she moved she gave me a couple of things which included a little flashlight which I still use to find cat toys which have rolled under the furniture. They weren’t grand gestures, but they were the little things that she kept sending year after year. Eventually I started putting more thought into finding good cards of my own to send, but I don’t think I’ve gotten up to her standard yet. No remembrance of Mom is complete without talking about pets. She loved her pets, and she loved other peoples’ pets too. She was one of our few house guests who would leave her bedroom door ajar for our cats to visit her at night. I remember one time – after she’d visited – sending her some pictures of our cats, and she asked, “But what about my friend, Blackjack?” Debbi’s cat had snoozed with her most nights while she’d been with us. Mom and her cat Maggie were made for each other: Maggie had had a rough kittenhood, and needed someone patient enough to let her get used to being a house cat. But Maggie is also an independent cat, which I think suited Mom’s lifestyle after she retired. So they had their routines, both together and separately. The last couple of years Mom would tell me how often she’d get up from her spot on the couch and Maggie would immediately move to it for the warmth. But I also have lots of pictures of Maggie sitting on Mom’s lap getting petted, both of them happy to have the other. These last few months lots of people have said to me how they appreciated Mom’s friendship, or her presence in the various communities she was a part of. I know all of you have your own memories of her, from different times and places that I didn’t really see, from school, or teaching, or volunteering. She did a lot of stuff, and touched a lot of people. I know she’d be touched and grateful that you all came out today. After the service we walked out to her grave. We were lucky that the humidity of the previous day had broken for a while, so it was a pretty nice walk. The caterers switched out the chairs from the service for tables for the luncheon. It was nice to talk to Mom’s friends, some of whom I haven’t seen in years, and catch up with some other people I don’t see often enough. One guest said that he appreciated the luncheon since, as he put it, funerals are often an opportunity for closure, but the luncheon was also an opportunity to keep some things open. The chapel was a great venue, too. If you look at it superficially it might seem dark and maybe a bit dreary, but it honestly didn’t feel that way inside, with lots of wood and gentle lighting. 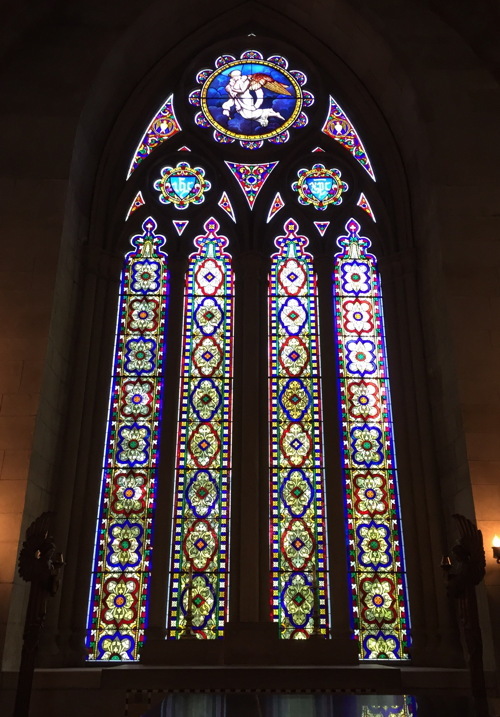 The fact that it was bright outside to help lighten things up through the stained glass was probably a factor, too. I remarked that I think Mom’s reaction to the service would have been that we didn’t need to go to all that trouble. But Debbi added that she’d have loved that we did. Things started wrapping up around 1 pm, and everyone had left by 1:30. I guess I wish people had stuck around a little longer, but I wouldn’t have wanted things to go on too long, either. So we had the rest of the day to hang out, as well as Saturday morning, to hang out. Katy and I left after lunch on Saturday, and Debbi and I drove down to visit her family for the rest of the day. Her niece – who I guess is also my niece now! – was performing in a dance recital and also celebrating her 14th birthday. The recital was – okay – a bit long, but actually pretty fun overall. And we had a fun time hanging out for dinner and cake afterwards. Sunday the weather was a mix of rain and humidity, and our flight home was delayed an hour and a half due to the weather. On top of that, Debbi had been fighting off a cold and it blossomed Saturday night, which made for a miserable trip home for her. But we finally made it home, unpacked, and collapsed into bed, surrounded by kitties happy to see us. We both took Monday off, and on top of Debbi being sick, I came down with a splitting headache late in the day, which clobbered the rest of my day. But at least we were able to get over our let lag, and make progress fighting off our respective ailments. The week leading up to this trip was very stressful as I worried about getting my talk done, how it would go over, and worrying about the memorial generally (even though I wasn’t the one doing the work). But it all went as smoothly as we could have hoped, I thought. And now we have a lovely spot where we can visit Mom when we go back to Boston. As a final image, here’s the view from her grave site. I think she’d have loved it.